Pre-shave oil is a frequently overlooked aspect of shaving due to the hustle and bustle of the day. However, pre-shave oil is the perfect preparation for a smooth shave. By adding this to your shaving routine, you will be amazed at the difference a few drops makes. So what’s the best pre-shave oil to add to your morning routine? We asked a few shaving experts to weigh in on the top brands. Have an opinion? Vote for your favorite products or leave a review below. The Art of Shaving Pre-Shave Oil (check price) is a top seller and was highly recommended by the guys that reviewed this product. The Art of Shaving brand takes a holistic approach to creating its signature products. They feature several pre-shave oils with various essential oils such as Lavender, Lemon and Sandalwood. This brand of pre-shave oil uses lavender oil to soothe and reduce razor burn. It moisturizes and softens the hair without making your face feel greasy. 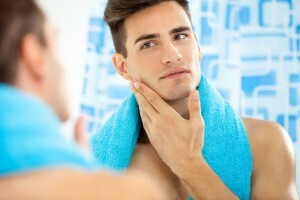 Other important pre-shave oil ingredients include Castor oil and Olive oil. Olive oil provides excellent lubrication while Castor oil helps eliminate dry skin and prevent irritation. Pre-shave oils are designed to take advantage of the helpful properties of essential oils. Sandalwood and Eucalyptus are examples of just two of the essential oils frequently included in pre-shave oils. What type of oils are in a bottle? Using pre-shave oil is easy. Add a few drops of oil into your hands and massage into your beard or stubble. This will help lift the hair from the skin to give you a closer shave. It works by improving razor glide to prevent irritation and razor burn. American Crew Essential Shave Oil (check price) is a popular choice with those who prefer a no fuss, no fragrance oil. The oil uses eucalyptus, and clove to help reduce the risk of ingrain hairs. With its all-natural ingredients, it is no surprise it makes the list. Taconic Shave Premium Organic Pre-Shave Oil (check price) uses organic oils and is enriched with vitamin E for additional moisturization. This particular shave oil has wonderful lubrication and comes in a convenient pump bottle. Shave Secret (check price) is said to dramatically reduce dry skin, rashes, ingrown hairs, and shaving bumps. The product uses all natural essential oils with a bit of menthol. There are no artificial ingredients, and the product is not tested on animals.